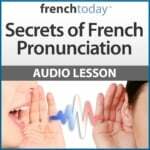 Learn how to pronounce the Paris subway station for the Eiffel Tower: “Bir Hakeim!” Clear French audio recording of the Paris métro station names of “la ligne six” (Paris métro line six): “Charles de Gaulle Étoile – Nation” + tips on how to safely ride the Parisian subway + a video of the Eiffel Tower from the métro. The most infamous stop of “la ligne six du métro parisien” has to be “Bir-Hakeim”, the stop for the Eiffel Tower, which is a real pronunciation challenge for most foreigners! The particularity of the Paris subway number six is that it is aerial between the stations “Passy” and “Bir-Hakeim”, offering a stunning view of the Seine and the Eiffel Tower. Go to the end of this article to see a video. Finally, get off at the “Bir-Hakeim” stop on the left bank will allow you to go to the Eiffel Tower along the “Quai Branly” on the left bank of the Seine. Now let’s study how to pronounce the Paris subway stations. Don’t keep your Paris subway ticket in your wallet. The black strip on the ticket is magnetized: being in contact with coins may de-magnetize the ticket, and the machine at the métro entrance will refuse it. If this happens to you, and you are at an entrance with a clerc, cut the line (how French) and just hand your ticket to the clerc… You don’t really need to say anything, since this happens a lot, the clerc will simply hand you another ticket… Just in case, say something like: “excusez-moi, mais mon ticket ne marche pas” (sorry, but my ticket doesn’t work).